MARIO TENNIS. Nintendo 64. Condition ----- GOOD(A-B-C-D-E)BAD. We are located in Osaka　Japan. It would help us understanding you. ★Condition Good （5-4-3-2-1） Bad. This item is 100% genuine product. ( about 1 month ～ more ). Etc.front extenal surface is burned by sun light. Who We Are. RCGcar racing. INDEX of Genre. You will be able to play with Japanese N64 console. It won't fit into US console as is. 64 Mario Tennis 64. Japan Version. Our aim is is simple: to provide excellent service and prices. Mario Tennis. Japanese Version. Light marks, scratches, or dirt. Good overall condition. 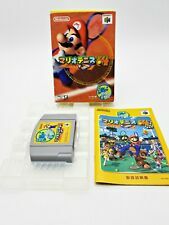 Nintendo 64 "Mario Tennis Golf Set". Nintendo 64 USED MARIO TENNIS 64. Sony PlayStation 2 USED Fate stay night (Realta Nua)Extra edition. Japan　Import. Sony PlayStation 2 USED　Dawn of Mana. Japan　Import. Sony PlayStation 2 USED BLEACH　Blade Butlers. Yoshi Story Yoshi's Nintendo 64 N64 Japan Japanese. 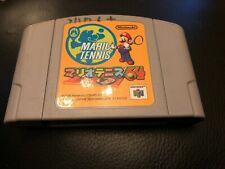 Rare Mario Tennis 64 Nintendo 64 N64 Japanese Jap Japan NTSC J Games may have some yellowing or minor marks, check pictures or contact me for further information, all games are tested and in full working order. Please check out my other auctions for rare video game merchandise and promotional items. Happy to combine postage on multiple auctions. Please contact me if you require further information about any of my items. Happy bidding. 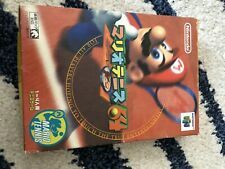 Rare Mario Tennis 64 Nintendo 64 N64 Japanese Jap Japan NTSC J Please check out my other auctions for rare video game merchandise and promotional items. Happy to combine postage on multiple auctions. Please contact me if you require further information about any of my items. Happy bidding. 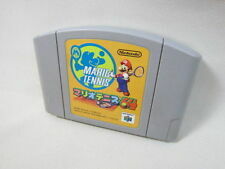 Mario Tennis (Nintendo64/game/worm. JAP). Condition is Good. Dispatched with Royal Mail 1st Class Large Letter. MARIO TENNIS. instruction: manuel now. 5.0 kg _ 1 0.0 kg 2 0.0 0 EUR. 6 5.0 0 EUR. 3.0 kg _ 5.0 kg 1 5.0 0 EUR. 4 5.0 0 EUR. 2.0 kg 3.0 kg _ 1 2.0 0 EUR.